…makes raw chocolate bars using fair trade cacao beans sourced from the Ashaninka people in Peru. He has a direct relationship with the people harvesting and processing the cacao. Pablo visits and sends them chocolate made from their beans! Specifically free from dairy, gluten, palm oil and soya. We now have access to pure unadulterated raw chocolate. 55% – high cocoa content chocolate made with coconut milk. 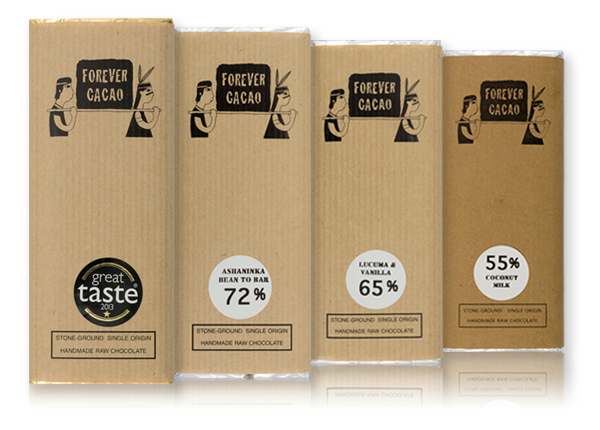 65% – delicious dark bar flavoured with Lucuma, producing a floral taste. 72% – classic dark raw stone ground chocolate, much more potent than commercially processed bars. 80% – deeply intense strong raw chocolate.